French geopolitics in Africa is interested in natural resources. Initially, the franc zone was set as a colonial monetary system by issuing currency in the colonies because France wanted to avoid transporting cash. After these countries gained their independence, the monetary system continued its operation and went on to include two other countries that were not former French colonies. At present, the CFA franc zones are made up of 14 countries. The fact that even today the currency of these regions is pegged to the euro (formerly French franc) and that reserves are deposited in France shows the subtle neocolonialism France has been pursuing unchecked. It is a currency union where France is the center and has veto power. This is supported by African governing elites who rely on the economic, political, technical, and sometimes military support provided by France. It is no wonder then that these former colonies are not growing to their full potential because they have exchanged development through sovereignty for dependency on France. This article investigates the set up of the CFA franc zones, its ties to French neocolonialism and its ability to further breed dependency in the former colonies of West and Central Africa. The first franc zone was set up in 1939 as a monetary region with a the French franc as its main currency. In 1945, the Franc des Colonies Francaises d’Afrique (CFA franc) and the Franc des Colonies Francaises du Pacifique (CFP franc) were created. After independence, Morocco, Tunisia, Algeria, and Guinea left. The Central African Economic and Monetary Union (CEMAC) and the West African Economic and Monetary Community (WAEMU) are known as the two CFA franc zones. WAEMU has eight members: Benin, Burkina Faso, Cote D’Ivoire, Guinea-Bissau (a former Portuguese colony joined in 1997), Mali, Niger, Senegal, and Togo. Their common currency is the “franc de la Communaute Financiere de l”Afrique (CFA franc), which is issued by the Central Bank of the West African States (BCEAO) located in Dakar, Senegal. CEMAC has six members: Cameroon, the Central African Republic, Chad, the Republic of Congo, Equatorial Guinea (a former Spanish colony joined in 1985) and Gabon. Their common currency is “franc de la Cooperation Financiere Africaine”, which is issued by the Bank of the Central African States (BEAC) located in Yaounde, Cameroon. It is worth mentioning that the BCEAO and the BEAC were headquartered in Paris until the late 1970s. Apparently, representatives from France fill important positions in the Presidency, Ministry of Defense, Central Bank, Treasury, Accounting and Budget Departments, and Ministry of Finance, which allows them to have oversight and influence policy decisions. One French scholar observed that ministries from Francophone African states make around 2000 visits to Paris in an average year. Adom shows the money kept at the French treasury earns no or very low interest for the franc zone nations. In 2007, the former Senegalese President, Abdoulaye Wade had stated that the funds can be used to boost investment, economic growth and alleviate poverty in the member countries instead of sitting in France. After the 1994 devaluation, the two CFA francs were pegged at the new rate of 100 CFA francs per French franc. The reason for the devaluation was accounted to loss of competitiveness as the French franc appreciated against the currency of major trading partners. These zones competitiveness was in the French market, but not to world markets. In the 1980s, there was a fall in the price of raw materials and a depreciation of the dollar. As a result, the growth and export of these nations were impacted. The governments of these zones were facing budget deficits, which they financed by borrowing from abroad until the IMF refused to lend them any more money in 1993. As for trade between the unions, it is low due to an external tariff. Capital flows between these unions is highly restricted. The hope that a monetary union would increase trade among the CFA franc zones never materialized. France is carrying out neocolonialism by disguising this arrangement as a monetary union. These nations gave up their sovereign right to France. Neocolonialism is an impediment to development within African nations. France’s intervention was carried out through economic, political and militaristic ways. The ‘Accords de Cooperation’ was signed by African leaders who gained power with France’s help at independence. On the other hand, the ‘Accords speciaux de defence’ provided France power to intervene militarily to protect African leaders who protected France’s interests. Lastly, the economic accords require former colonies to export their raw materials such as oil, uranium, phosphate, cocoa, coffee, rubber, cotton … etc to France while importing industrial goods and services primary from France. Furthermore, these nations reduce or ban their raw material exports when French defense interest require. 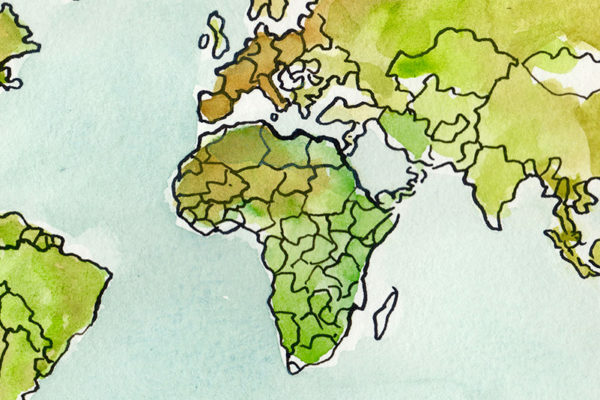 Africa, Asia, and Latin America have pursued sustainable development since gaining independence. However, a few countries succeeded in actually developing their economies. In the 1950s, Raul Prebisch and other economist came up with the dependency theory, which explains why “economic growth in the advanced industrialized countries did not necessarily lead to growth in poorer countries.” Prebisch suggested that poor countries (periphery nations) exported raw materials to the developed countries (center nations) and imported finished goods. Moreover, there is a dynamic relationship between dominant and dependent states. Andre Gunder Frank claimed that the capitalist world system was divided into two concentric spheres: center and periphery. The advanced center countries need cheap raw materials from the underdeveloped periphery as well as a market to send their finished products. It has been decades since African countries gained independence. However, this independence was replaced by a dominance-dependence relationship known as post-colonialism. A dominance-dependence occurs “when one country is able to participate in a definitive or determining way in the decision-making process of another country while the second country is unable to have the same participation in the decision-making of the first country.” Furthermore, the foreign and domestic policies of the independent African nations continue to be influenced by outside powers, especially their former colonizers. The post-colonial relationship when it came to former French colonies is the dominant role held by France. French colonialism was one of state colonialism. It was one of direct rule where native chiefs assisted French administrators, which led to the rise of local elites who were educated in the French system. The former colonies were indoctrinated with French culture, language, and law. In the time of independence, sub-Saharan colonies decolonized in a non-violent way while former British colonies gained their independence through war, a violent way that loosened the relationship towards Great Britain. Because freedom from France was carried out through non-violence, it came naturally for local elites to take power and continue their strong ties with France. Through the CFA franc zone, France is able to control the money supply, monetary and financial regulations, banking activities, credit allocation, and budgetary and economic policies of these nations. In addition, it breeds corruption and illegal diversion of public aid between France and its former colonies. For instance, conditional French public aid has forced these African states to spend the ‘aid’ money on French equipment, goods or contracts with French firms, especially construction and public work firms. France is the main trading partner of the CFA franc zones. CFA franc zones, unlike other African nations, have avoided high inflations due to France. The two zones between 1989 and 1999 had 33 percent of imports and 40 percent of Foreign Direct Investment from France. These regions are highly dependent on France. Despite their ties to France, these CFA franc zones remain extremely poor. The two regions had a population of 132 million in 2008 where 70 percent are in WAEMU and 30 percent are in CAEMC. Their total GDP is equal to 4 percent of the French GDP. These regions are “producers and exporters of raw materials, including oil, minerals, wood and agricultural commodities, and agricultural commodities, they are highly sensitive to world price fluctuations and the trade policies of their trading partners, mainly the EU and the US. Their industrial sectors are rather underdeveloped.” Non-oil producing nations within the CFA franc zones have very low GDP per capita. In conclusion, the CFA franc zones continue to be dominated by the political will, economic interest, and geopolitical strategy pursued by the French republic. It seems some elite leaders do not wean away from France’s influence. President Omar Bongo of Gabor said, “France without Gabon is like a car without petrol, Gabon without France is analogous to a car without a driver.” The previous quote can be applied to almost all of the franc zone nations. The set up of the currency unions benefits France more than its members. French colonialism is preventing the development of these nations and causing them to be dependent. Oh, Nigeria and Zimbabwe, have been looted by their own elites, with South Africa as a shining example following the crowd? The US and EU government are paragon of virtue.? And who is to blame? The voters? The evils of colonialism live long after decolonization. Yes, the English are to blame for their ex Colonies actions, especially those in N America. Local greedy and corrupt, ruling classes contribute little to bad Governance. The “white settler” countries (USA, Canada, Australia and New Zealand), where the indigenous population was mostly exterminated, were treated very differently to the African colonies. Also, the USA fought a war for its independence (250 years ago!) and the right to use the resources on its territory for the benefit of the local whites AND extensively used African slaves. The African colonies were consciously kept dependent, and were only “given” independence post-WW2 with little or no real attempt to develop independent local administrators and elites. They were also locked into dependency relationships and a number of leaders were assassinated (e.g. Lumumba). The corrupt ruling classes are a symptom of the underlying cause – colonialism, neocolonialism, and ongoing Western interventions to circumvent any real independent politics. So, YES the English (and the French, and the Portuguese …) are responsible for destroying the African nations that they colonized, and then continuing to subvert their ability to develop. The CFA seems like a giant slush fund that France and its African lackeys can use for a variety of adventures and schemes. Sort of off topic but visit a supercar showroom in Paris sometime and you’ll often see one of the beneficiaries of Françafrique adding to his fleet. I think the criticism here is that France is still a colonialist power imposing a monetary system on its former colonies and thereby usurping their sovereignty. The African or Pacific Francs must be repatriated as euros only through the French Treasury. So where does Christine Legarde get off calling our reserve currency status an excessive privilege? At least we left the heavy handed colonial tactics to a third party – the IMF. The former French colonies now nominally independent are the best run in sub Saharan Africa. perhaps it’s better to maintain an ongoing relationship, through Co opting the local ruling class. It worked for Scotland, tho it was hard on the cleared Highlanders. The African elites can say what they want about colonialism. The natives are voting with their feet. As the Pew research shows essentially all Africans except for the kleptocrats (who already have their lily pads in Europe) want to go to Europe. The tragedy is that the poor listened to the Muslim leaders when they were fighting the French. Had the French stayed in Algeria it would have ended up as the California of Europe. The Muslim radicals convinced the peasants that the French, who brought modern agriculture to a stone age society, had stolen their patrimony and that they, as Muslims, should not take orders from white Frenchmen. Now France has to support the growing African masses in France without the benefit of the natural resources. Improving colonialism rather than abandoning it would have been a better strategy. Read:”the case for colonialism” by Bruce Gilley. The consequences of this post colonial disaster are destroying Europe and reaching America as well. “brought modern agriculture to a stone age society”, you need to do some actual research on African history – try Algeria and Senegal to begin with, these were both not “stone age” before the French arrived. Many of the current immigrants used to find work in Libya, a middle income country that the West destroyed. Another huge chunk come from Syria, with the destruction greatly aided by foreign fighters funded by the likes of Saudi Arabia and aided by the US. Your “white mans burden” must be feeling so heavy for you to carry…. Thanks for the sanity and history, Robert. This has been a revealing thread. Or the French make sure that the elites understand “the consequences” of such attempts at self-determination. They were more than happy to supply the jets for Libyan regime change.